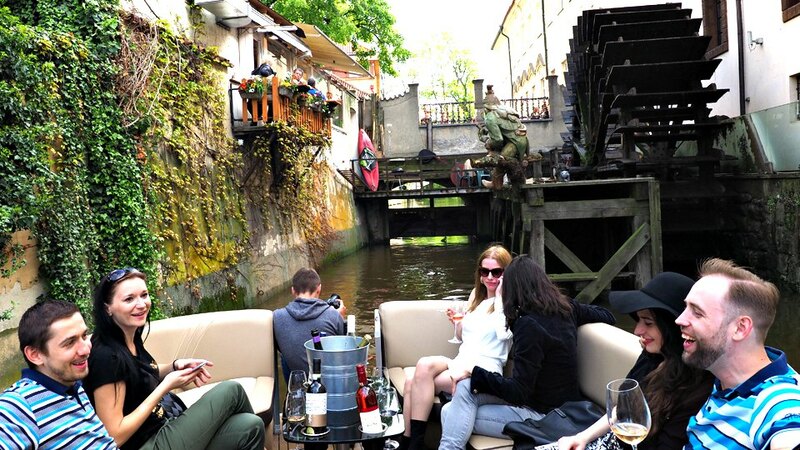 Cruise along historical part of city centre and taste 5 samples of fine authentic Bohemian & Moravian wines with local wine enthusiast, in an intimate atmosphere with comfort surrounding. The Wine Boat is equiped with comfortable leather seats and cool wines for your pleasure. Great for sociable guests – solo travellers & small groups. Available only on Fridays (July – August) & Saturdays (April – October). Designed for couples, enjoying extra room on designated couches. Available every day (except Monday) from April until October. For families, birthdays, bachelor(ette) parties or team buildings. The carefully selected wines are both from, Bohemian and Moravian wine regions of Czech Republic. Wine enthusiast Andre & captain Ema, joined forces to create this tour for wine lovers and groups, looking for semi-private experience. Sometimes, Ema’s little dog “Lucky” joins us to listen to some music and enjoy the breeze. Excellent contact during the booking process. We had the tour in the evening and it was fantastic. The boat was super comfortable, the wine was tasty, the tour guides knowledgeable and friendly, and of course the city was gorgeous. Thanks to the team Andrej & his captain Ema.We will come back. Increíble, muy buena experiencia para regalarle a mi novia. Muy ricos vinos, excelente el trato y amabilidad de ambos que se esforzaron por explicarnos en español. Muy agradable el paseo, altamente recomendable, mucho mejor que los barcos grandes y masivos! !